"At @oatmealsny, which opened in Greenwich Village in 2012, oats are, finally, properly adored. Not as a conveyor of health benefits, but as an indulgence. 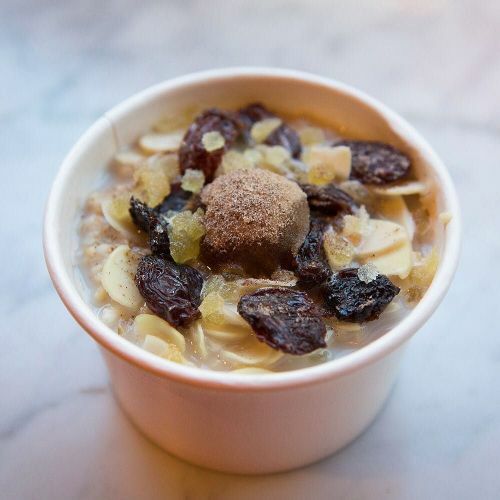 The cafe serves 30-odd variations of oatmeal inspired by Asian cuisines, candy and Elvis. Here, @andrewscrivani photographed @oatmealsny's Indian-spiced oatmeal, which combines the flavors of chai, cardamom and crystallized ginger, and is mixed with almonds, raisins and a splash of coconut milk. Visit the link in our profile to read the full @nytfood review." By nytimes on Instagram.